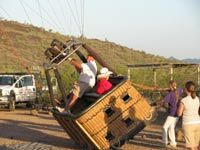 As a part of a very fun and exciting 7 days in Scottsdale golfing 150 holes, kayaking down the Salt River, off roading up and down the beautiful red rocks of Sedona, we also went in a hot air balloon high above the desert floor. 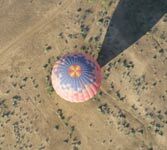 Prior to leaving Texas, a couple people recommended that we check out Hot Air Expeditions and book a trip with them. 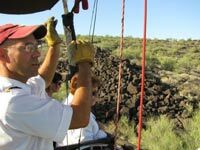 Touted as "America's Best and Largest Hot-Air Balloon Operation," Hot Air Expeditions has been offering visitors the chance to experience something unique and different for 18 years in Scottsdale and Monument Valley, Utah. They offer morning flights year round and seasonal flights in the late afternoon. 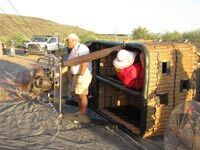 There are three different sized baskets that hold six, eight, or 12 people and each flight lasts about and hour to an hour and a half. The trips are great for families, reunions, corporate events, or romantic getaways - you can take a romantic flight for two, propose or even tie the knot - how cool is that. The flights are very safe and suitable for anyone 5 years or older. We got up excited and ready to go at 4:30, piled in the Hot Air Expeditions vans at 6:00,and departed for our launch site. 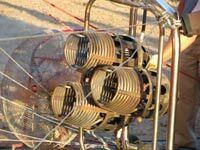 Hot Air Expeditions has multiple launch sites, all of which are determined by the winds the morning of the departure. Our site was north of Phoenix in the Pioneer Living History Village parking lot. It was very interesting 30 minutes watching the pilots and balloon crews prepare and inflate the balloons for liftoff. 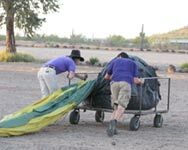 Our balloon was over 200 feet tall and held over 250,000 cubic feet of hot air which is needed to lift the 10 person basket that we were flying in. 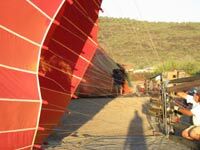 The sequence of pictures shows the hot air balloon liftoff process. 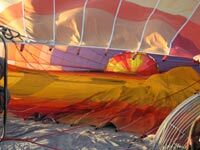 Once our hot air balloon was inflated and while it was still tied tightly to a huge truck and with 4 flight attendants holding the balloon somewhat secure, all 10 of us climbed into the basket and our pilot (Capt. Patrick) fired up the propane burners and we slowly started our assent - directly toward a tall tree. Having pricked a balloon with a pin and watching what happens, I glanced at Capt. Patrick to see if he saw the tree. He looked like he saw it, didn't appear nervous about it, and proceeded to fly within 5 feet of touching it - all on purpose. We were amazed at how easily he was able to control the ascents and descents and rotate the basket 360 degrees to give us a variety of views at various elevations and heading different directions. Of course he has no control over horizontal flight direction and was at the mercy of the wind and where it wants to take the balloon. Capt. 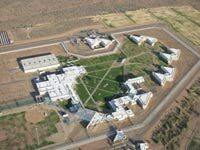 Patrick took us up over the Pioneer Village, flew by the branches of a tree that we could touch, crossed over the state prison (making the guards a little nervous - they kept a close eye on us at all times as Capt. Patrick told us some good prison stories), and he flew us up and down from 5000 feet catching different currents for a different direction over the desert. Capt. 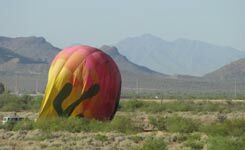 Patrick was a wealth of information about ballooning, the desert, and the local area - and he had a couple good tricks that he shows during the flight that he made me swear I would not disclose! It's peaceful and quite and the views of the desert, wildlife, lakes, mountains, cities and skylines, and golf courses are amazing. After about an 90 minutes, you can see the chase cars heading out through the desert to where they think our hot air balloon would land and lo and behold, we put down right next to them. 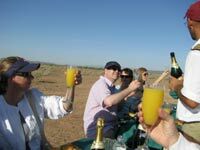 We got out of our balloon and sat down to a breakfast prepared by a gourmet chef - chilled Champagne, orange juice (for good Mimosas), Quiche Lorraine, chocolate-filled croissants, soft cheese, and seasonal fresh fruit. Seemed very strange to be eating and drinking next to a 200' balloon with 10 other people in the middle of the desert! All too soon, we were loaded in the van and crossing the desert on our way back to our car. Fun, unique, and thrilling adventure. Give it a try. To read more about this fun trip to Scottsdale, read our Golfing in Scottsdale article.